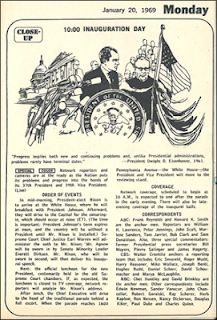 It's the dawn of a new era in American politics, with the Inauguration of Richard Nixon and Spiro Agnew as President and Vice President of the United States. Out with the old, corrupt LBJ administration, and in with...wait, how did that all work out again? I try not to get too hung-up on politics here, and since I've done my fair share of writing on JFK, think of it as part of the equal time clause. Coverage started at 10am ET on all three networks, and would continue throughout the day, featuring the swearing-in at noon, the parade throughout the afternoon, and the inaugural balls following the late local news. For the first time, networks discuss the idea of providing political analysis of the president's inaugural address; as NBC producer Robert Shafer says, "I've felt the Inaugural has been covered in the past too much like a sporting event. I'd like to give this one more historical perspective." Network anchors admit a decided lack of enthusiasm for the parade, which, Chet Huntley says, is "kind of a bore." His colleague David Brinkley is more delightfully pungent: "Every state demands to be seen in it, so it always drags on three hours or more, going into absolute darkness, and nobody can see the end of it." Concedes Walter Cronkite, "how can they [cut it out]? It's one of our ceremonials." Security is expected to be tight for the parade; President Nixon will be riding in a new limo with bulletproof windows and, like LBJ in 1965, will be seated behind bulletproof glass in the review stand. The glass will make it impossible for famed cowboy actor Monty Montana to repeat his 1953 trick of lassoing President Eisenhower. And once again there's the ghost that's present by its absence, something that happened between Eisenhower and Johnson that caused the increase in security, the bulletproof glass and limo. Five years later, it still hangs overhead. And now, as Paul Harvey would put it, the rest of the story: the man to the right of Nixon in the Close-Up is Earl Warren, Chief Justice of the United States, whose duty it is to administer the presidential oath*. Warren, wanting to ensure that his successor shared his liberal judicial views, had announced his retirement in June 1968 in order to allow President Johnson to nominate the new Chief. That man, Associate Justice (and LBJ confidant) Abe Fortas, would come under intense fire for alleged ethical violations and, after a contentious Senate filibuster, his nomination would be withdrawn. Warren, stymied in his efforts to - well, frankly, manipulate the situation - agreed to remain on the bench until the next term (which wouldn't begin until after the election), in a deal in which his son-in-law acted as intermediary. His son-in-law was none other than John Charles Daly - the same John Daly who'd been host of What's My Line? for so many years and then moved on to head Voice of America, and had married Warren's daughter Virginia in 1960. Small world, isn't it? *Nixon had for many years been a harsh critic of Warren, and it must have irked Warren greatly to be administering the oath to him. That had to have played into his thinking as well. 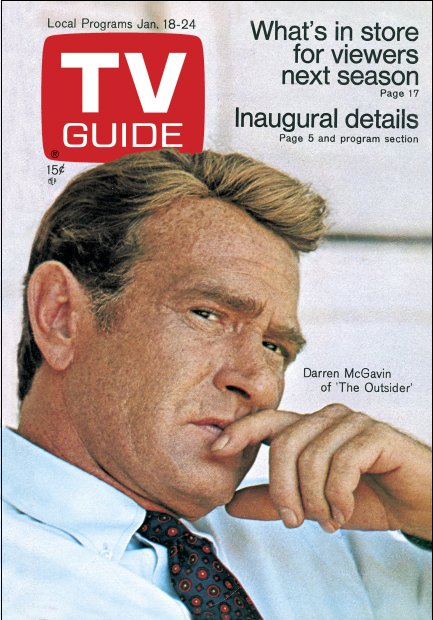 Darren McGavin, star of NBC's Wednesday night private detective series The Outsider, is an outsider in more ways than one. Digby Diehl tells us that McGavin has a reputation for being egocentric and difficult to work with - says former costar Burt Reynolds (Riverboat), "Darren McGavin is going to be a very disappointed man on the first Easter after his death." That's a very good line, very funny - I didn't know Burt had it in him. Anyway, McGavin did several interviews for TV Guide in the 60s, and comes across as blunt, gruff, a straight-shooter who's free with his opinions and doesn't care whether you like them or not. A sampling: Mike Hammer, Mickey Spillane's famous detective, whom McGavin played for two years, was "a one dimensional person. Mike Hammer is of another era, another time. He's not a valid man in this world." Violence on television? "How can anybody seriously be surprised about violence on TV and movies or in ghettos and campuses when the United States Government is resolving a conflict today in Vietnam not only with violence, but more or less illegally." Gun control? "Firearms, all firearms, should be abolished. That includes sidearms and shotguns for the police. And then we would get rid of guns." He doesn't see it happening, though, as "the gun lobbies are too strong." David Ross, the character McGavin plays in The Outsider, is one of the actor's favorite roles; the fictional man and the real one share a common background and characteristics. They're both outsiders, McGavin explains, having come up from broken families, spending time in jail, learning life on the streets. "[A]mongst herd animals in Africa a strange thing happens to an animal that has not had the normal herd experience, one whose mother is killed. That animal is always an outsider to the herd. They reject him inasmuch as he does not want to relate to the herd. He develops his own path and ethic." No surprise that McGavin has a copy of Colin Wilson's existentialist study, The Outsider. As for acting, McGavin acknowledges that the legitimate theater is his true love, but that "you can't go back and do play after play." For all of television's faults, "even in that context you can do something." And that is what he would do, for years to come. Ed Sullivan: Tentatively scheduled guests: Liza Minnelli; singer John Davidson; Gary Puckett and the Union Gap; the Lennon Sisters; comedians Wayne and Shuster, and Scoey Mitchell; and Victor the Bear. Hollywood Palace: Roy Rogers and Dale Evans present a country show. Guests: Burl Ives; George Gobel; "Beverly Hillibilly" Irene Ryan; singers Sonny James and Jeannie C. Riley; and the Stoney Mountain Cloggers. Hmm. Both shows have strong lineups. Liza Minnelli was well on her way to a great career, and the Canadian comedians Johnny Wayne and Frank Shuster* appeared on the Sullivan show 67 times, more than any other guests. But Victor the Bear - well, you be the judge. *Frank Shuster's uncle was Joe Shuster - co-creator of Superman; Frank's daughter Rosie was for a time married to Lorne Michaels and served as one of Saturday Night Live's chief writers at the beginning (thanks, Kliph!) We're just full of tidbits like that this week. The Palace has a big-name lineup, including two of my favorites from my childhood, Roy Rogers and Dale Evans, but the guests are mostly country (except for George Gobel - how'd he get in there? ), and I'm not a big fan of country. That keeps them from coming out on top, but you can't ignore the strength of their schedule. I just can't make up my mind. The whole Palace show is online and starts here. My verdict is Push. What do you think? 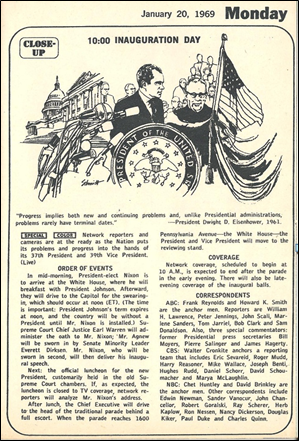 Leslie Raddatz (male, not female) gives us a sneak peak at what the networks might have in store for the 1969-70 season. According to his sources, five factors above all are at work influencing the programmers: 1) the national revulsion against violence in the wake of the assassinations of MLK and RFK; 2) the decline in audience interest in movies making the transition from theaters to TV; 3) the emergence of "Negroes" as a force in the entertainment industry; 4) the rising cost of filmed (as opposed to taped) programs; and 5) the popularity of half-hour sitcoms over hour-long dramas. Crime, war and spy shows are out, and there are only two Westerns on the docket. A quick scan through the potential series yielded a few tidbits: CBS had UMC, which with a different lead (Chad Everett instead of Richard Bradford) wound up being Medical Center; To Rome With Love with John Forsythe; and The Jim Nabors Show; NBC weighed in with a post-I Spy vehicle for Bill Cosby, which would have been The Bill Cosby Show; The Whole World Is Watching, a drama about three lawyers that evolved into "The Lawyers" segment of The Bold Ones; and Flip Out, which became The Flip Wilson Show. ABC doesn't have much, but the ones that stood out were The Courtship of Eddie's Father (with Bill Bixby); Mr. Deeds Goes to Town (with Monte Markham); and The Brady Bunch (enough said). What missed doesn't usually bear much scrutiny; I never did see anything of Philip Clark and Skye Aubury in Barefoot in the Park, or Stefanie Powers (our loss) in Holly Golightly, and we'll never know what our lives might have been like had The Punxatilly Pioneer made it to the small screen. Game shows featuring celebrity participants, while not what they once were, are still to be found in the late 60s. Longtime warhorses such as What's My Line?, I've Got a Secret, Password and To Tell the Truth have all disappeared in the last year or two, destined to return in diminished form via syndication strip programming, but you can still find your favorite B-list stars throughout the daytime network lineup. *Ina Balin also starred in the Jerry Lewis movie The Patsy, which ABC happens to be showing that Wednesday. If celeb shows aren't your thing, you could still appreciate NBC's Concentration, Jeopardy and Eye Guess, while ABC offers Let's Make a Deal, Dream House, The Newlywed Game and The Dating Game. You notice CBS missing from this list; the network, which today airs the only network daytime game shows, had axed all of their games by 1969, concentrating instead on sitcom reruns and soaps. 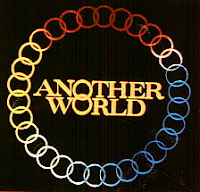 Speaking of the sudsers, there are plenty of those as well: General Hospital, One Life to Live and Dark Shadows on ABC, Love of Life, Search for Tomorrow, As the World Turns, Love is a Many Splendored Thing, The Guiding Light, The Secret Storm, and Edge of Night on CBS (they also had the only talk show, Art Linkletter's), and Hidden Faces, Days of Our Lives, The Doctors and Another World on NBC. So for your daytime television viewing, you had 14 soap operas, 13 game shows, five sitcom reruns, one morning show (Today), one morning news show (CBS), a children's show (Captain Kangaroo), an interview show, and a partridge in a pear tree. * Six hours were given back to local stations (half of that from ABC, which didn't begin its morning feed until noon), although preemptions were common throughout the daytime lineup. *Actually, I made that last one up. By contrast, today's daytime lineup is thus: four soap operas, three talk shows, three morning shows (with Today now running an extra hour), two game shows, and 10 hours of local programming, most of which is filled with more talk shows, fake judge shows and the like. I grew up with these shows, in the summer months when school was out, during Christmas break in the winter, and on those days when I was home sick. I loved watching them - well, maybe not each individual one*, but the concept of them. Sure, some of them might have been cheesy, but I miss them. If I had children, I'm not sure I'd let them watch daytime TV today. *I didn't like the soaps, but my mother did and so they were on. She was partial to the NBC lineup, especially Another World. I actually - and quite unintentionally - share my first and middle name with a character from that show (albeit with a slightly different spelling), but that's another story for another day. Finally, a quick word on sports. There isn't much. The NFL and AFL both played their all-star games on Sunday, a week after the Super Bowl; the NFL gathered in its traditional (for then) venue of Los Angeles, while the AFL visited Jacksonville, a city as yet without professional football, which the league might have been checking out. It would have been a joyous meeting for the AFL all-stars, as they would still have been celebrating the Joe Namath-led Jets' victory over the NFL's Baltimore Colts. It was the greatest moment in the history of a franchise that holds the dubious distinction of having the longest span of time between Super Bowl appearances - 44 years and counting. Watching the Jets upset the Colts (my second-favorite team, you'll recall) was one of the most traumatic events of my young sporting life, so to any of you Jets fans moaning about your Super Bowl drought, you can cry me a river. Fred Silverman, then CBS vice-president of daytime programming, thought game shows drew older audiences, preferring the more youth-appeal soap operas. Tony Randall, of course, would come to series TV the following year with THE ODD COUPLE...alongside BAREFOOT IN THE PARK, only with black actors as the newlywed couple--the male being Sullivan guest Scoey Mitchll. I have seen THE OUTSIDER once, in one of those TV movie mashups of two episodes Universal was fond of doing. In fact, I feel that it was what they delivered to NBC in place of what the network wanted--a weekly COLUMBO series, in the wake of the success of the PRESCRIPTION:MURDER TV movie--that Peter Falk did not wish to provide. McGavin presumably was a private eye version of the lieutenant. George Gobel started his career on WLS Radio in Chicago, as a yodeling boy singer on The Old Barn Dance, when he was a teenager. Offhand, I'd say that qualifies him as 'country'. "Funny You Should Ask" would be revived in a slightly-different format as a syndicated show in 2017.